Today is L.M. Montgomery’s 141st Birthday and it is time to party like its 1874 because it feels like everyone is pulling out their best table linens and china to commemorate the event. After years of hard work from fans and academics of trying to prove and validate Montgomery’s connection and influence to literature and culture, one could certainly argue that she is part of a zeitgeist. Yes, I’m using my fifty cent words today. Zeitgeist. 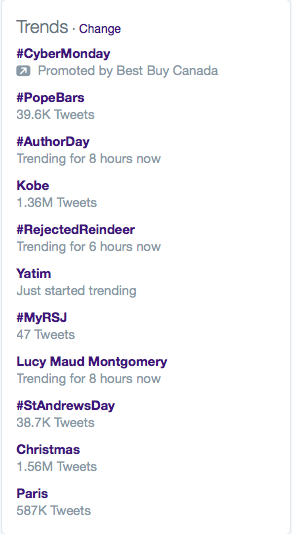 Montgomery has been discussed recently by Margaret Atwood, Felicia Day, and Mindy Kaling. Featured in memoirs about reading and life by Samantha Ellis, Erin Blakemore, Nancy McCab and–as a good friend of mine pointed out Caitlin Moran and Lena Dunham. Even Lisa Simpson is a fan. 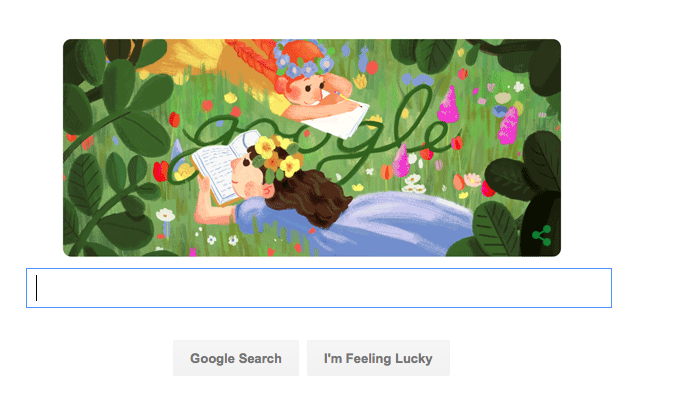 because of Google’s Doodle today, featuring three scenes from the Anne books. And November is an amazing month for literary birthdays. Montgomery is in good company with one of her favourite author, Louisa May Alcott. 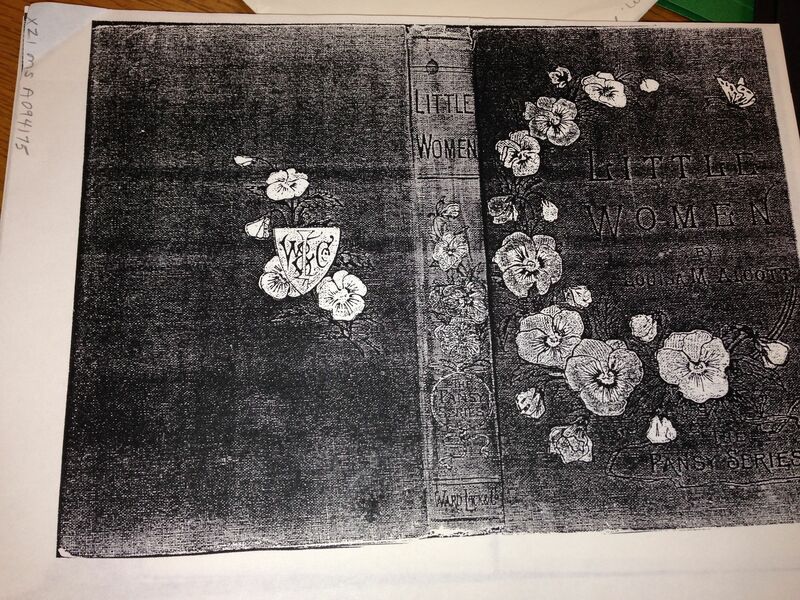 This is a picture of Montgomery’s copy of her much loved, well worn copy of Little Women that I took when visiting theL.M. Montgomery Research Centre at the University of Guelph’s archives. Notice that it is so well read that I could only see a photocopy!!! 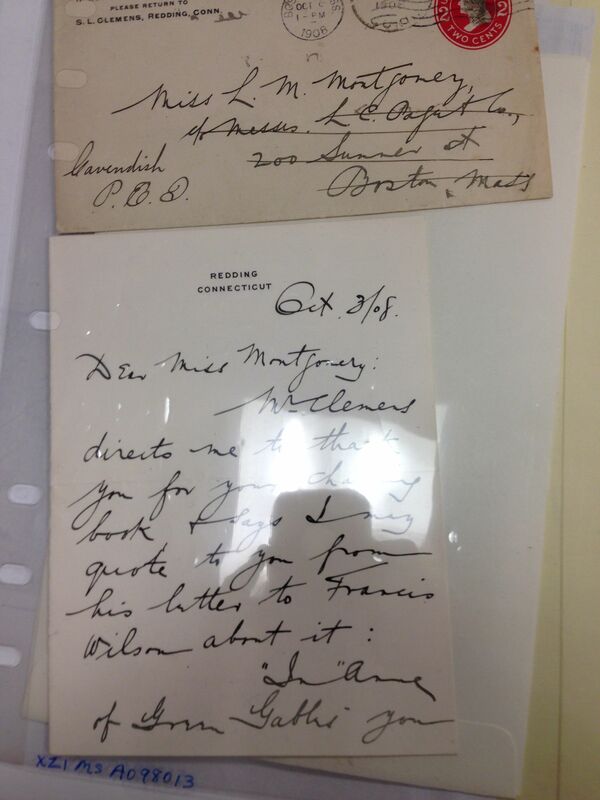 Today is also Mark Twain’s birthday, who loved Anne so much he (or his assistant) wrote Montgomery a letter. I got to see it when I was last at the archives. So Happy Birthday, Maud! Perhaps there is a special place where writers congregate together and perhaps you and Mr. Twain are sipping tea when you see Ms. Alcott walk by and you (nervously) ask her to sit down and the three of you pass away a pleasant afternoon, talking about writing. This entry was posted in Anne of Green Gables, Authors, Children's Literature, Inspiration, L.M. 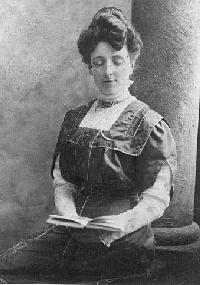 Montgomery, Writing, Writing Life and tagged anne of avonlea, anne of green gables, anne of the island, Anne Shirley, Author Birthdays, Breath through Entertainment, Caitlin Moran, canadian authors, Cinefilles, Erin Blakemore, Google, Google Doodles, l.m. montgomery, Lisa Simpson, Little Women, Louisa May Alcott, Margaret Atwood, Mark Twain, Mindy Kaling, PEI, Samantha Ellis, teen books, The Simpsons, Vappu Kannas, Writing. Bookmark the permalink. Happy 141st! I like that Google featured the anodyne liniment cake. Such a good story. I didn’t know about the Mark Twain letter. What does he say? 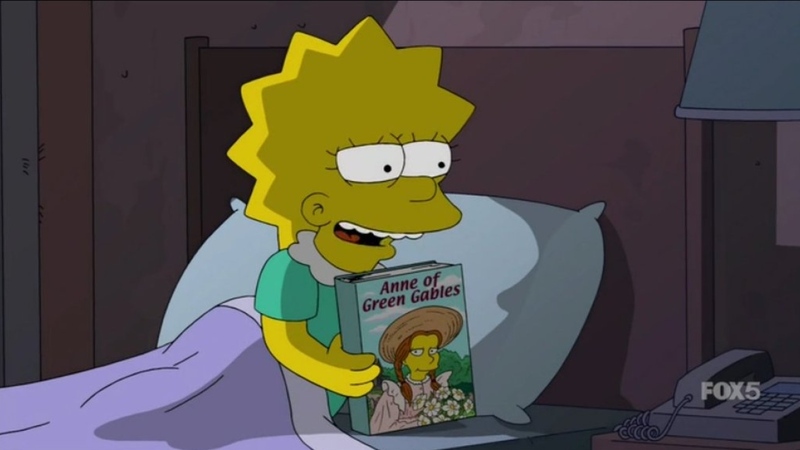 Sage read some of “Anne of Green Gables” to Faith this week on The Young and the Restless too – #1 Daytime drama.